PAD & FOLD An added resting pad means more storage options and improved storage stability, while the redesigned tiller handle allows the stored motor to take up less space. WITH A TWIST The driveshaft on the new F9.9F and T9.9G has a special centre section that is narrower than the ends. 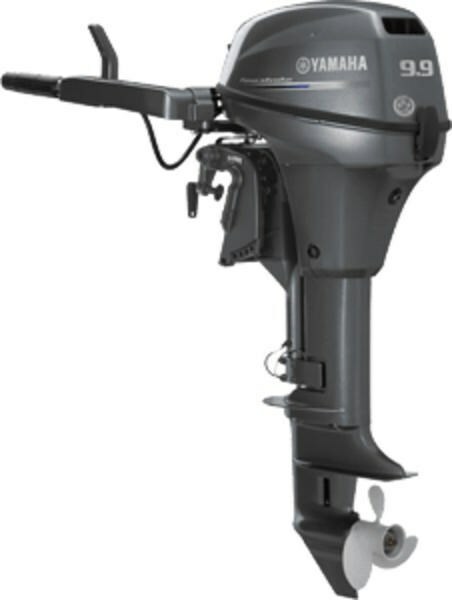 It is designed to temporarily "twist" should the prop coming into hard contact with an underwater object, protecting the powerhead, propshaft and other vital engine components. CONTROL The shortened tiller handle is now easier to use than ever before. Its new shift level shape provides better grip for precise shifting. FUEL SIPPER Thanks to advanced Yamaha four-stroke engine technology the F9.9 boasts outstanding fuel economy - substantially better than 2-stroke 9.9-hp models. FRONT & CENTRE Convenient front-mounted controls facilitate smooth shifting, easy, shallow water drive and single action steering friction adjustment. ANTI-CORROSION PROTECTION Yamaha's unique YDC-30 aluminium alloy protects the engine's exterior parts, while a zinc coating, high-quality stainless steel and 5-stage exterior coating offers long-lasting protection inside and out.